Mix a light application of a balanced organic fertiliser into the soil prior to planting. In midsummer, drench plants with a liquid plant food to stimulate new growth. Dwarf types with upright plumes provide great contrast in form when mixed with flowers that have flat daisy-type blossoms. Tall cockscomb type varieties often are grown as cut flowers. 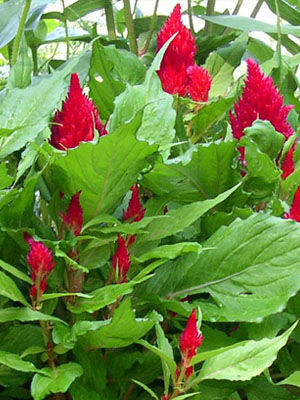 Sow shiny black celosia seeds in warm, moist seed starting mix. Seed germination is fast and sure, but most gardeners buy celosia seedlings. Where summers are long and warm, you can direct-sow celosia seeds in spring. Allow 30cm (12 inches) between very tall varieties. Celosia may reseed in warmer areas, but not in an invasive way. Flower colours include shades of red, yellow, orange, and pink.